Some people are ridiculous when it comes down to their exaggerations. 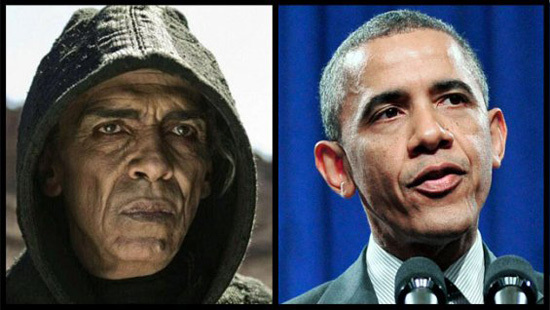 There is supposedly a striking resemblance between Satan in the History Channel’s series ‘The Bible’ and President Barack Obama. I don’t see it; but the media is having a field day with it by saying there’s a comparison. The show’s ‘Satan’ character is dark-skinned, while President Barack Obama, who is mixed, is more fair-skinned. Coincidence, or not-so-subtle political commentary? A major hit already, History Channel’s 10-part miniseries The Bible is stirring up extra attention for its casting. The role of Satan, i.e. the bad guy, is played by the actor Mohamen Mehdi Ouazanni, who, thanks to makeup and other production tricks, bears a startling resemblance to President Barack Obama. How rude of them assholes. Anthony, Mahogany, ha y’all doin? Question: I was told that the ppl on the show “The Bible” are just as white as can be. Is this true? Because if so, they went and got a black man to play the devil?! And really Obama is not a bad person, so other than what I just asked, I have nothing for this. Why they made the movie and no one looks as described in the book??? Now lazy folk who don’t read (not even the most popular book of all time) will watch the movie and take everything they see to be true as GOSPEL. all Black ppl look alike to them so they just being factual and true to life. This post fulfills the required “Obama Hate” portion for those who hate him. This post fulfills the required “Obama Hate” “portion for those who hate him.